Showtimes: 4:30 p.m., 7:00 p.m., 9:20 p.m. 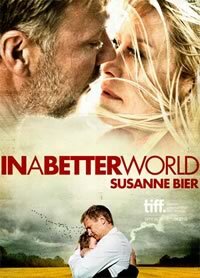 In A Better World, a Special Presentation at the 2010 Toronto International Film Festival® and winner of the 2011 Academy Award® for Best Foreign Language Film, explores the First World’s relationship with the Third, the conflicting demands of the family and the society, while offering a devastating critique of masculinity. In a war-torn African nation, physician Anton con­fronts a steady stream of tragedy and loss. Back home in Denmark, his estranged wife Marianne is concerned about their eldest son, who is picked on mercilessly by the class bully. In a Better World raises essential questions about human instincts and our interpretation of knowing what's right and what's wrong. Monday Night at the Movies gratefully acknowledges our partnership with Film Circuit and its sponsors. Film Circuit is generously supported by Presenting Partner Telefilm Canada, Lead Sponsor Bell, Major Sponsors RBC and Blackberry, Sponsor Cineplex Entertainment LP and Supporter the Ontario Media Development Corporation.